Voters In Poland, Guatemala And Argentina Surprise Establishment Candidates : The Two-Way Polish and Guatemalan voters have decisively rejected their current leadership, while Argentina is headed for a run-off. Candidates from the right won in Switzerland. 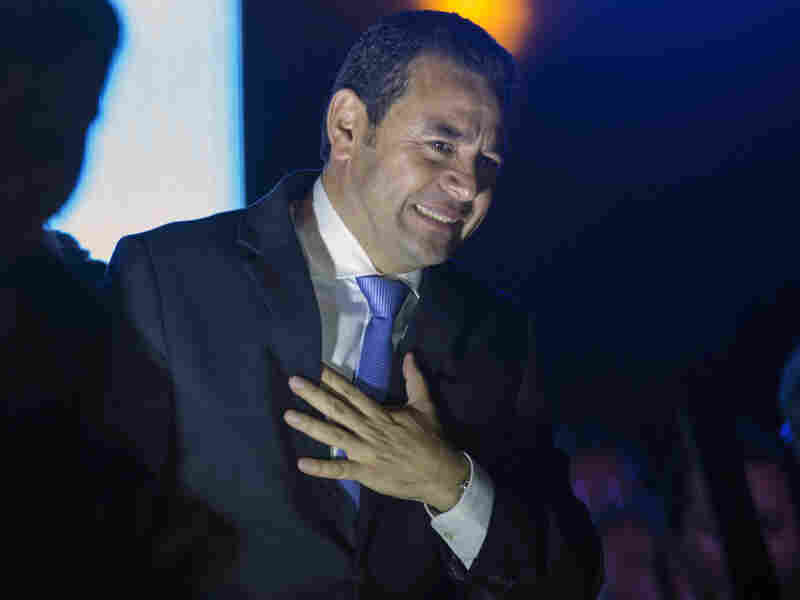 Jimmy Morales, the National Front of Convergence party presidential candidate and former television comedian, won a presidential runoff election in Guatemala on Sunday. Polish and Guatemalan voters have decisively rejected their current leadership, while Argentina heads for a runoff. Polish voters went with the right-wing opposition party Law and Justice on Sunday. The party leader, Jaroslaw Kaczynski, is a former prime minister and Eurosceptic who has publicly opposed a European Union plan to require member states to take in refugees from the Middle East and North Africa. It was a sweeping victory: For the first time since the transition from Communist rule in 1989, none of Poland's left-wing or social democratic parties appeared to have won seats in the new parliament. The victory is part of a larger rightward shift on the continent. The anti-immigrant, fiscally conservative Swiss People's Party, or SVP, triumphed in that country's recent parliamentary elections. And polls show Marine Le Pen's far-right National Front party on track to gain control of two northern regions in France in upcoming December regional elections. In Guatemala, voters also opted for change. Jimmy Morales, a former TV comedian who has never held elected office, cruised to victory over former first lady Sandra Torres. Morales — who campaigned under the slogan "I'm not corrupt nor a thief" — portrayed himself as a divisive break with the Central American country's discredited ruling class. Former President Otto Pérez Molina was forced to resign last month and is currently in jail awaiting trial for his alleged participation in a multimillion-dollar customs fraud case. Voters in Argentina did not reject its current leadership in the manner of Poland or Guatemala this election cycle. But Sunday's election did defy expectations that outgoing President Cristina Fernandez de Kirchner's anointed candidate would win an outright victory, without having to participate in a runoff. Instead, Kirchner-endorsed Daniel Scioli, a former vice president, just barely edged out conservative opposition candidate Mauricio Macri. The economy was front and center in this campaign: Inflation is around 25 percent and foreign reserves are dwindling. Kirchner was constitutionally prohibited from running for a third consecutive term. She was elected to the presidency in 2007 after her husband, Nestor Kirchner, decided not to run for re-election. He had been elected to Argentina's top office in 2003 and died in 2010. Together, the couple held the presidency for a dozen years. A previous version of this post wrongly identified Marine Le Pen's political party as Les Republicains. She leads the National Front party. It also stated that former Argentine President Nestor Kirchner died in 2007 — the correct year is 2010.